The Shamrocks welcomed a new member to the coaching staff last week as Foxboro native and recent North Dakota blue line stalwart, Jordan Hampton joined Sean Fisher's staff as an assistant coach for the U19 team. Hampton - who also played a year at Northeastern and for the USA U18 team in the Czech Republic World Championships - will primarily help with the defense. Like many teams at all levels today, the Shamrocks encourage an up tempo, push the pace and puck-moving style for their blue line. During her career as a player and specifically at North Dakota, Hampton has seen that transition in style and did her best to adapt on the ice. "I myself, I grew up as a defensive defenseman," she recalled recently. "Only defense drills, all the time, and never playing forward. Nowadays, even in high school, they're putting defensemen in as forwards in drills. There's more offensive opportunities and most goals are now scored by defensemen. It's a huge difference compared to what it was." But while the game behind the blue line has trended towards creating more offense, Hampton and Fisher will stress to their rearguards to never forget their roots and maintain structure. "Being on the outside, obviously you can see everything as a defenseman," she said. "If you go in, you have a little tunnel, but you have to be able to get back out right away and get to where you need to be. I'm fine with the defense going at it and coming in, but they just need to get back at the end of the play." Another key attribute Hampton brings to the Shamrocks is that she is fresh out of a Division 1 program. That means she knows what it takes to not only make it to that level but excel at it, as she did with North Dakota becoming one of their best blueliners. "In my personal college experience I have learned a lot from different schools and coaches," Hampton said. "I will do my best to find my athletes the best college fit for them as an individual. They need to make sure that is the best fit for them and they aren't thinking about anything else because I had to transfer in order to find my perfect fit. I want my athletes to make the right first decision and to be happy with their decision. I am very excited about coaching this year with the Shamrocks. We have a very talented and diverse roster and I am excited to help these girls get to where they want to be as players and people in the next level." 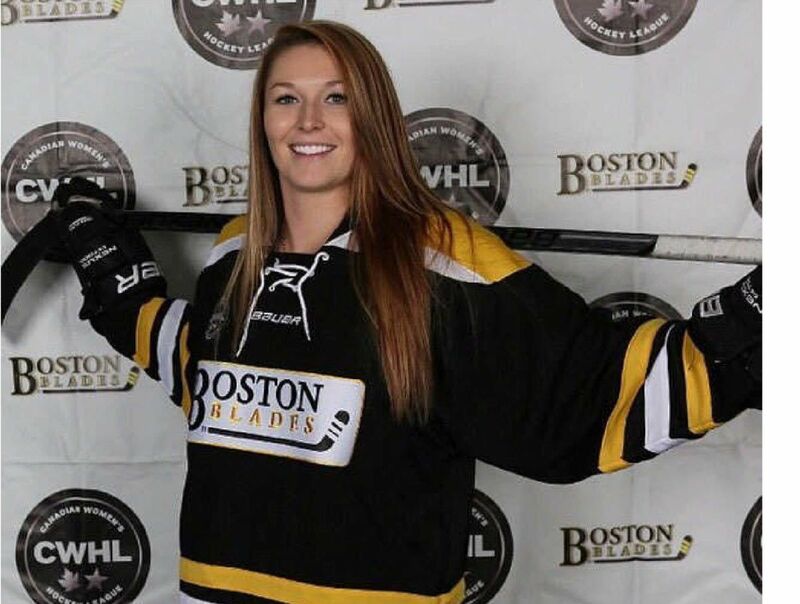 Oh by the way, should her players ever pursue a pro career, Hampton has that covered too now as she just signed with the Boston Blades of the CWHL. "I am very excited and humbled to be named to the Boston Blades in the CWHL," "I have always dreamed of playing professional hockey and I finally get the chance to live my dream and be a role model for young girls who want to keep growing the game of hockey. I couldn't be more thankful for the opportunity."